I’ve had my first experience of a comment hanging in the air for what seemed like a whole minute, during a conversation with friends this month. The comment, damning of religion, was uttered by a delightful person who also happens to be a fervent Christian. 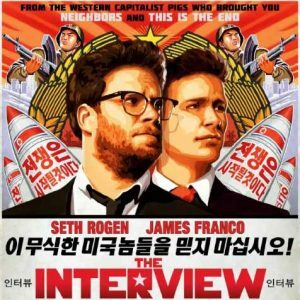 It all began with discussion about the troubled Sony Pictures movie, The Interview, with Seth Rogen. The Interview is a comedy about a secret operation to abduct North Korea’s despotic leader, Kim Jong Un, a man who rules his country like a vengeful god (is there any other kind?). In the discussion the argument arose that if the movie had been about killing Barack Obama, more hell would have broken loose than just some hacking. For the sake of argument, I was positing the thought that there is a big difference between making a movie based on killing a democratically elected leader of a country that while not perfect does uphold basic rights, compared to a movie based on killing a brutal dictator who rules unaccountably and subjects his population to poverty and terror. It was at this point that the magical comment arrived. Many believe they need him for their own survival because they’ve been brainwashed since birth. That comment just hung there. We were both taken by surprise and dumbfounded by the obvious irony. There were so many potential replies racing around in my head like, did you just say out loud that brainwashing people to subject themselves to an all-powerful being from birth renders people helpless later in life? This was a beautiful moment and it highlighted two things to me. Firstly, we must all be vigilant about what ideas we expose our children to as they grow and develop. It’s only later, when kids hit their teens that they begin to think for themselves and see the bigger picture. It’s only then they begin to ask whether their parent’s teachings make sense and are correct. However, depending on the power of the indoctrination in their childhood, people’s ability to successfully question anything is likely stifled their entire lives. This says to me that exposing children to the fundamentals of critical thinking in a measured, age-appropriate way, will be the most enduring and valuable gifts a society or parents might bestow upon children. A child is not a Christian child, not a Muslim child, but a child of Christian parents or a child of Muslim parents. This latter nomenclature, by the way, would be an excellent piece of consciousness-raising for the children themselves. A child who is told she is a ‘child of Muslim parents’ will immediately realize that religion is something for her to choose -or reject- when she becomes old enough to do so. Let children learn about different faiths, let them notice their incompatibility, and let them draw their own conclusions about the consequences of that incompatibility. As for whether they are ‘valid,’ let them make up their own minds when they are old enough to do so. Imagine a world abuzz with clear thinking beings focused on what works according to evidence rather than spending time spinning their wheels or flashing their swords in deference to a sky puppet that our pre-science forbears created in their quest to make sense of the world. Who could have guessed that something insightful could have arisen from a fun discussion about a trashy-but-controversial comedy movie? Maybe it was worth making after all.